MONROE, N.C. - Feb. 18, 2016 - PRLog -- The Artists Music Guild just came off of a very exciting and successful year in 2015. It celebrated its 5th year anniversary last November by bringing into Union County some of the largest and most iconic performers in musical history. People such as Martha Reeves and the Vandellas, Billy Paul, Melba Moore and Melanie Safka. The event was hosted by American Idol alumni, Bucky Covington. As the lights came up on the stage one things was for sure, the Artists Music Guild truly knows how to put on one of the best shows in the industry. The secret to their success is really no secret at all. It is their partnerships and community outreach that garners them the support they receive. Sponsors such as Cadillac, Mercedes, Ford, Publix Supermarkets, Olive Garden and a huge after party supplied by LongHorn Steak House make the Artists Music Guild the event that no one wants to miss out on. Certainly the real focus for the Guild is their educational outreach into the public schools. Last year the Guild mentored with over 450 public school kids in the Monroe Crossing Mall. An event that brought legends into town to work with teachers and students alike. Now let us not forget that the CEO of the Guild is no stranger to fame himself. As seven time Emmy Award winner, David L Cook is a musical phenom that came from one of the most iconic musical backgrounds one could imagine. His family were the Cook Family Singers who came to fame as regulars on the Grand Ole Opry. David remarked, "It is important that we take our history and merge it together very carefully with our future so that we give those younger ones a firm foundation to stand on." Cook is certainly leading the Artists Music Guild in that direction. During the AMG Convention the Guild partnered with Chick Fil A (David Rowland) to feed over 300 students during their day of mentoring, while Office Max and the Guild provided each student in attendance with a book bag and school supplies. The AMG offers monthly programs at the Monroe Crossing Mall and this month is sure to thrill all of the oldie lovers. 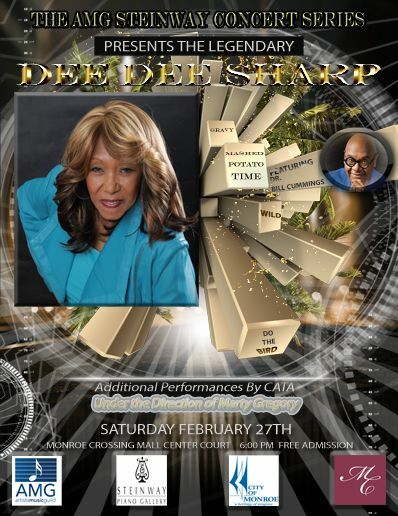 R&B legend, Dee Dee Sharp will be in concert February 27 starting at 6:00 pm. She will be performing all of her hit songs such as Mashed Potato Time, Gravy and The Fly just to name a few. Sharp will be accompanied by music genius Dr. Bill Cummings who himself just released his new album, "Almighty" to rave reviews. But just when you think that is enough, the Guild goes one step further and pulls in the community by showcasing three wonderfully talented students from CATA under the direction of Marty Gregory to perform with Mrs. Sharp. The public is encouraged to get there early as it is free admission and seating will be limited. The Guild is also currently working with Diamonds Direct to launch their new ECJ Luxe Collection with a VIP party on February 25th. Appearing at the launch party will be Tony Award winner, Ms. Melba Moore who is releasing her new album "Forever Moore," David L Cook and Dee Dee Sharp. Sarah Painter from Monroe, NC will also be in attendance as she is the currect face of the ECJ Luxe Collection Charlotte Division. The AMG Heritage Awards will be broadcasted February 20th at 3:00pm EST on Dish Networks Sky Angel. The program will air coast to coast and runs approximately two and a half hours. So make sure to tune in. The Beach Is Coming To Monroe!